Reviewing the Newest Product in the Range of Chamberlain Garage Door Openers | Doors by Nalley, Inc. The Whisper Drive Ultra-Quiet and Strong 1/2 horsepower belt drive is the latest in the range of reliable Chamberlain garage door openers, offering a blend of quietness and power. It features Chamberlain’s exclusive MVIS (motor vibration isolation system) to reduce noise by eliminating power-head vibration, so it is the perfect choice if you have rooms above your garage. For extra convenience, the Ultra-Quiet and Strong opener features a timer that closes the garage door automatically if you forget to. Another feature is MyQ technology (with optional additional accessories) to enable the door opener to automatically control exterior and/or interior lights. You’ll never have to come back late at night to a dark house again! Anti-burglary technology: A brand new code is sent whenever the remote control is used. Safety sensors with brackets that project an invisible beam across the door opening. 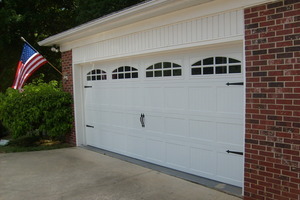 If anything interrupts the beam when the garage door is going down, the door is automatically reversed. Opener lights that automatically turn on when the protective infrared beam is broken. Sensing technology to prevent the door from shutting if contact is made with an object or person. Finally, as with all Chamberlain garage door openers, this model comes with an excellent warranty which includes a 1-year accessory warranty, 5-year parts warranty, lifetime belt warranty, and lifetime motor warranty. For Chamberlain garage door openers in Charlotte NC, contact us at Doors by Nalley, Inc. A family-owned business for over 20 years, we are proud of the high-quality craftsmanship and excellent customer service we provide. Give us a call anytime!